As you can see, Lynette's art looks stunning, especially when accompanying your diploma. Here is a sample of our largest print size, 19 by 13 inches. Please note the mat is not included. This is our medium print size at 14 by 11 inches. Please note the mat is not included. At 11 by 8.5 inches this is a print size suitable for one diploma, as shown here. Please note the mat is not included. Lynette has been creating masterful drawings for University Lithos since 1994. Now, she offers the prints sold directly so that you can choose the matt and frame that best suits your decor. The samples above show prints in their most popular matting options. The universities listed below are all available directly from the store. You can view samples in Lynette's university gallery, or by clicking one of the listed institutions below. 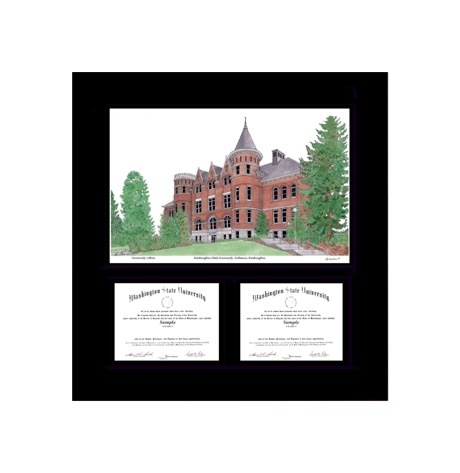 All university images are available to order as cards as well.